“Deck the halls with boughs of holly” is a popular Christmas song lyric, but how about…deck the fingertips with hats of Santa? 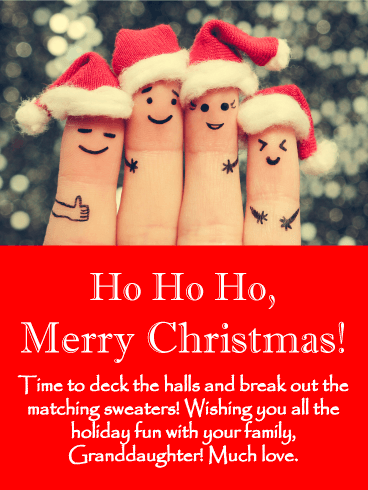 Okay, that’s a bit of a stretch musically, but you have to admit this Christmastime finger family is pretty cute! 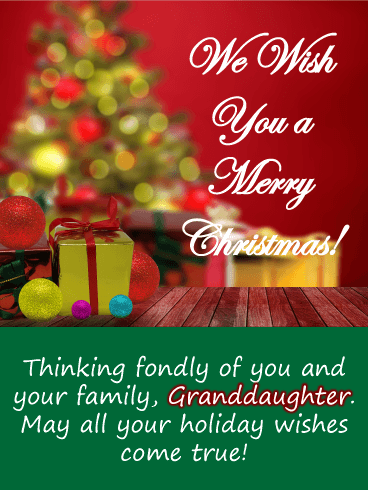 Wish your darling Granddaughter and her lovely family a very Merry Christmas by sending this silly FingerTip Family card! Ho ho ho! From the tinsel on the tree to the glossy presents sitting beneath it, your parents have always given you the perfect Christmas. Toys you wanted, your favorite candy, and lots of time to play in the snow. 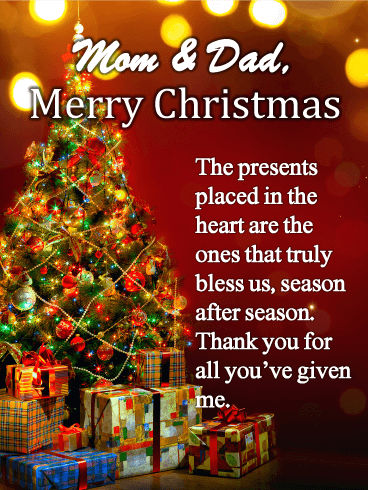 Return the favor this year and make this Christmas perfect for your parents. 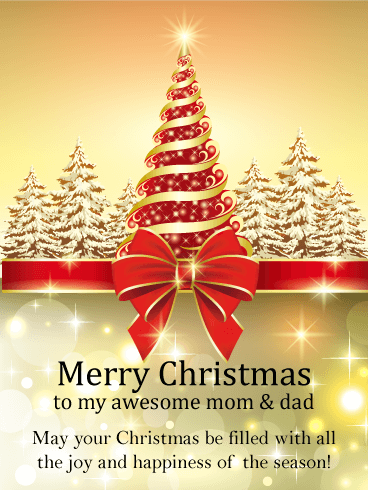 Use this gorgeous Christmas card to make sure their Christmas is incredible. 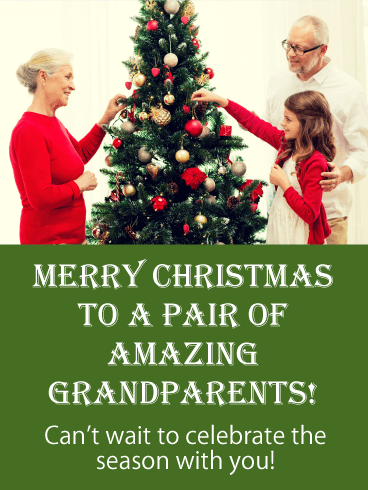 Shrink time and space to send your love to your parents for Christmas! For those that spend the season away home, Christmas can be strange but the warmth of family is never far. It lives in your chest, a core of traditions, love, and peace. 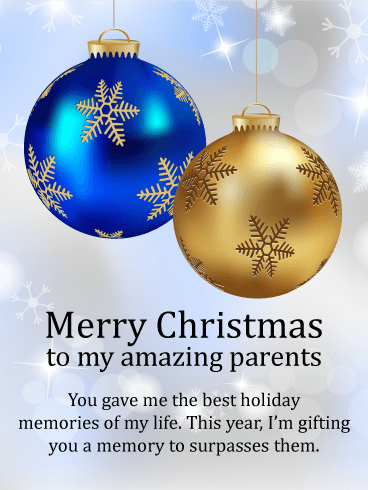 Let your parents know you are thinking of them this Christmas. 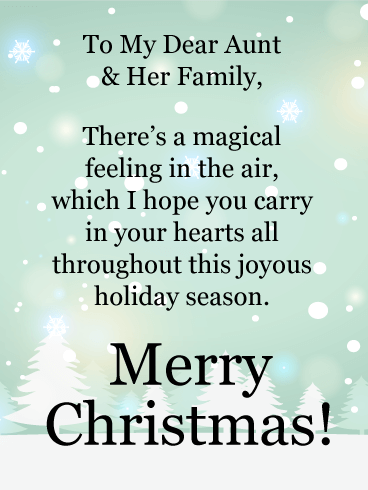 Send them this beautiful card to express both your sorrow at being away and your love for them this holiday season. 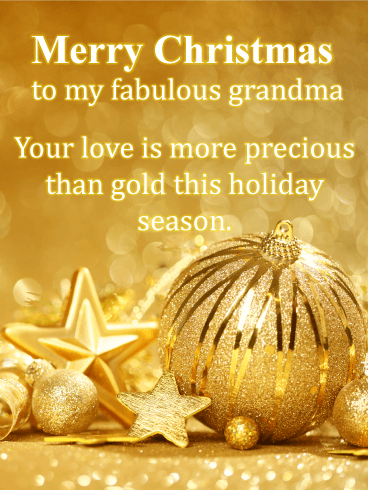 Let your grandma know there are few things in the universe as precious as she is with this golden Christmas card! Not a day goes by when you don’t think of your grandma and remember all the love she has for you. From sneaking you candy to allowing you to watch TV on a school night, your grandma is a jewel in your life. 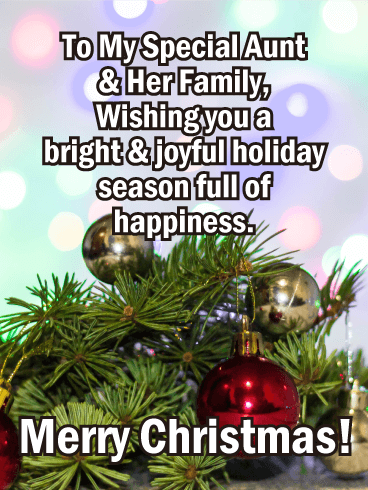 This Christmas, show her you love her with this golden Christmas card. The power of your emotions will make her feel cared for. 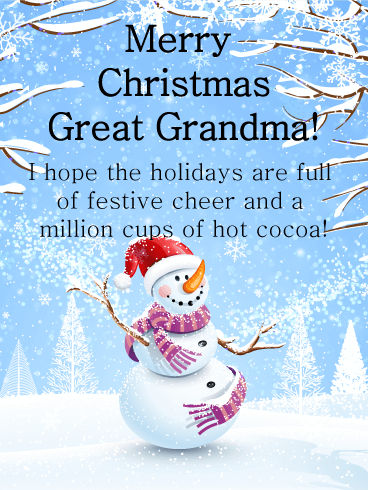 Make the coldest season of the year the one filled with the most love thanks to this Christmas card for your grandmother. 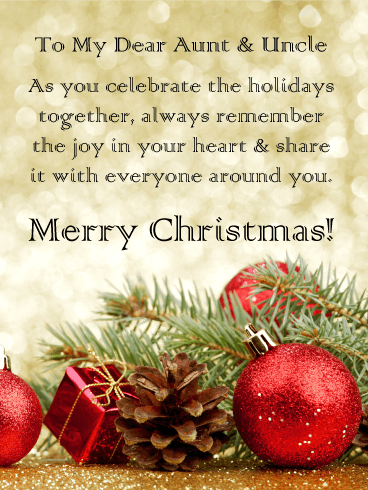 Christmas time is filled with wonderful memories of time spent with loved ones. Wonder and excitement. Soothing companionship. 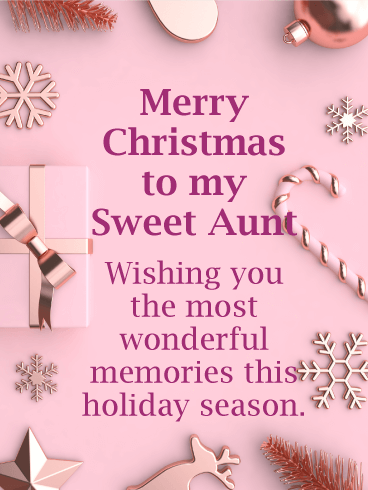 Each memory warms the heart as well as any Yule Log. 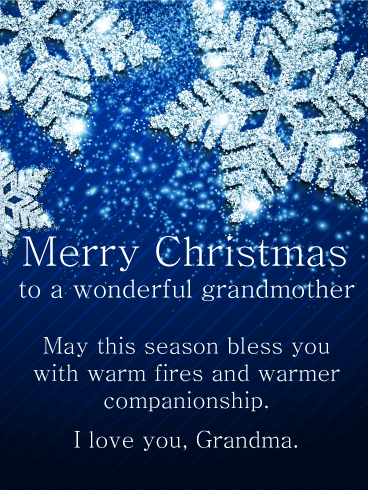 Share warm wishes with your grandmother with this beautiful Christmas card. Christmas sweaters are a cultural tradition; from festive to goofy they’re a sign of the holidays. But like any gifted clothing, they carry with it the memories of the person who gifted it. And nothing is better than a sweater from Grandma. Let her know that her love, like her gifts, has kept you safe and warm. It wraps you in joy and companionship. And now it’s her turn! 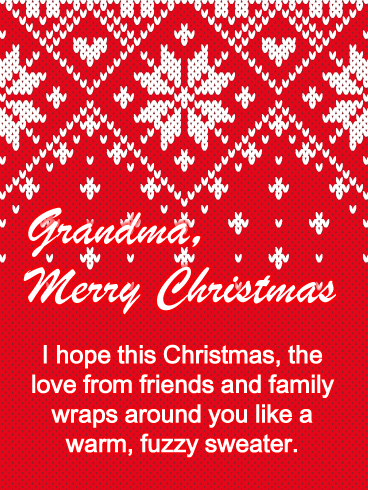 Send joy along with this card to your grandma this year. There’s nothing quite like a nana’s love. This season, show her how much you care by sending her holiday cheer. Featuring warm red and gold colors, this card conveys love and affection, bringing to mind fond memories of time spent with loved ones. 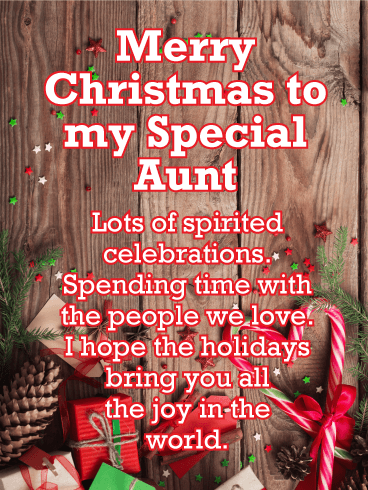 And who is your Nana, but the centerpiece of a dozen Christmas memories. 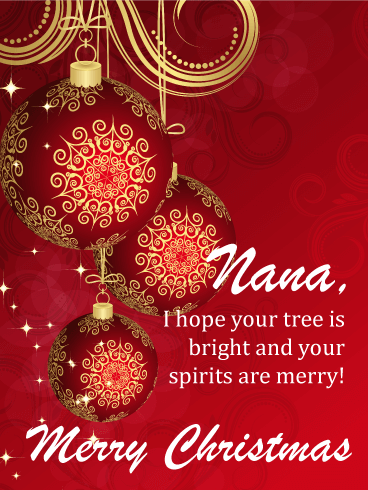 This elegant card is a simple way to make this holiday season perfect for your beloved nana. 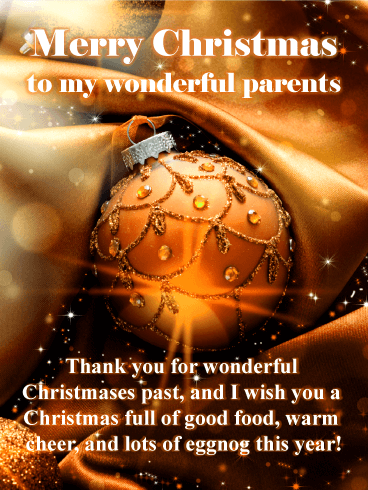 Make your parents' Christmas jolly with this memorable Christmas card! Christmas time always brings up dozens of wonderful memories. When we're children, it's a time of wonder and excitement. 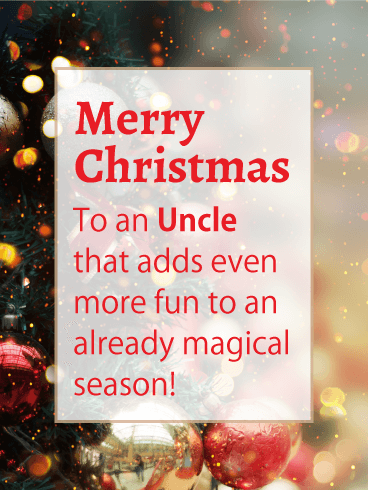 It's no less incredible as adults, feeling the magic in the air and cozying up with loved ones. Memories of these times, regardless of their age, are tiny treasures. 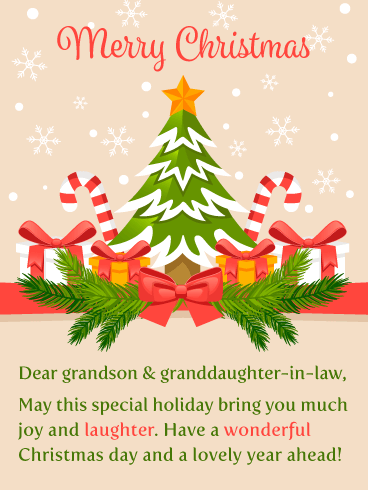 Make this Christmas your parents' most precious memory by sending them this card! 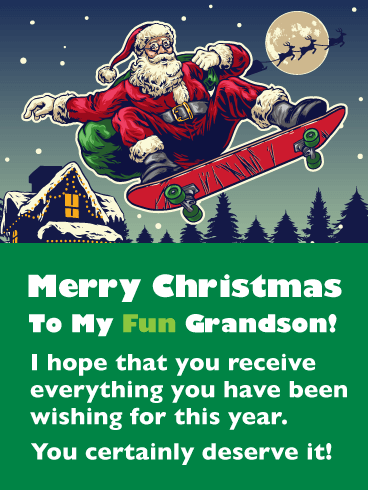 If you have a Grandson that loves to have some fun then this is the Christmas card for him! It features a retro style Santa having a little skateboarding fun as he makes his Christmas deliveries. 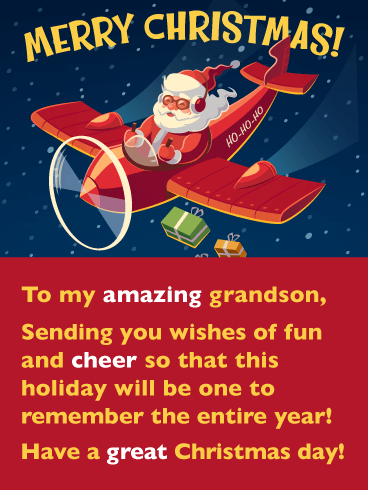 The message will let your grandson know that you hope he receives everything he has been wishing for. 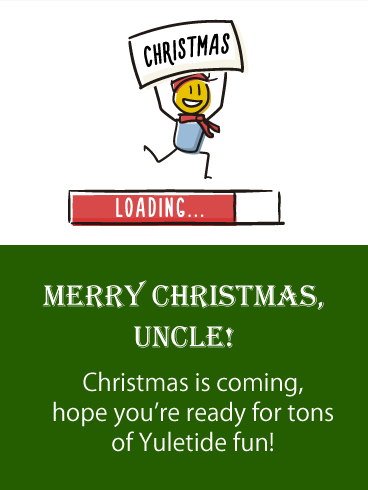 He will surely appreciate that you sent such a cool Christmas card! 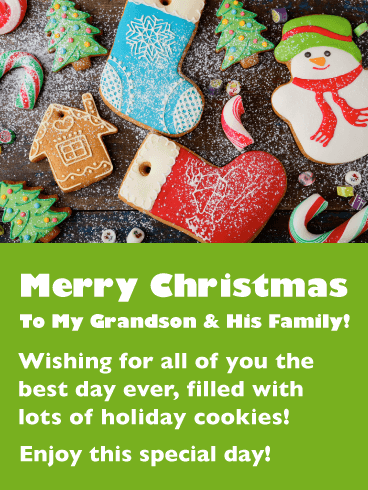 So send Santa on his way to wish your grandson a Merry Christmas today! 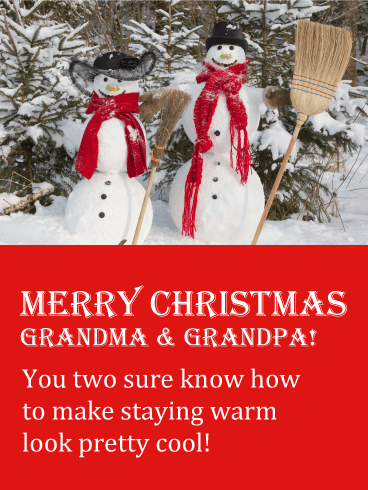 If you want to impress your grandson, send this clever Christmas card his way! It will let him know that his grandparent is computer savvy and has a good sense of humor! 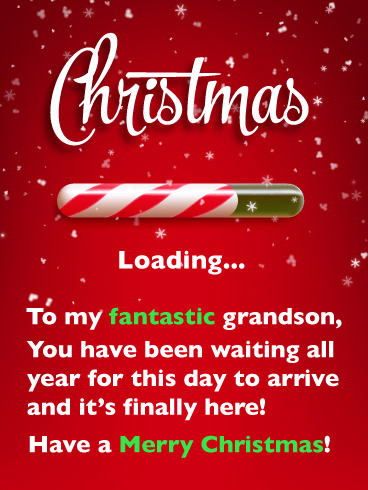 This Christmas card features a loading bar that represents how your grandson has been waiting for this fabulous holiday to arrive! He is going to love this greeting card! 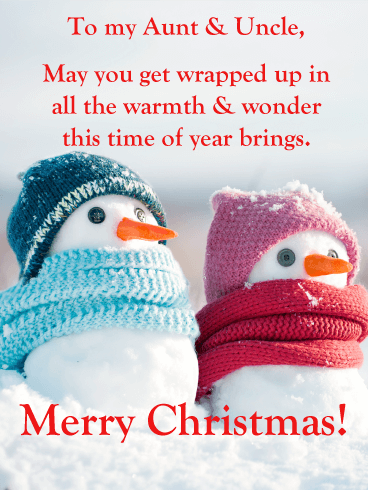 Remind him that the time has come to have a Merry Christmas by sending this awesome Christmas card out today! 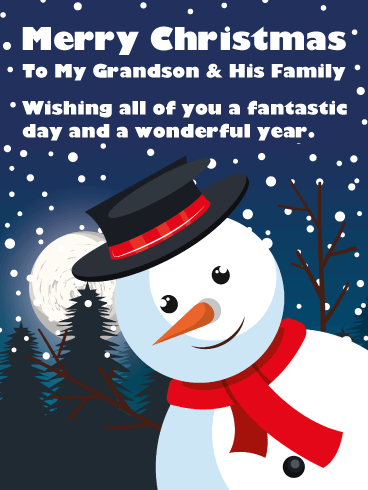 If you are looking for a Christmas card that your grandson will adore, this one would be perfect! This awesome Christmas card features a puppy wearing a Santa hat. So cute! 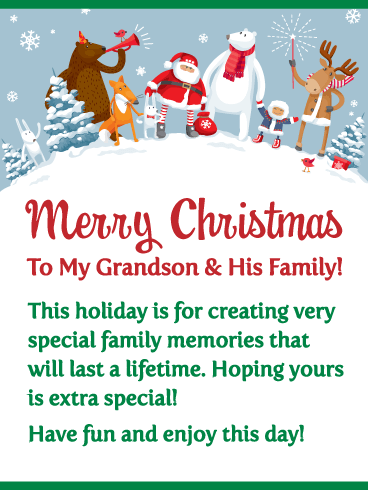 It will certainly brighten your grandson’s day and let him know that you are thinking of him. 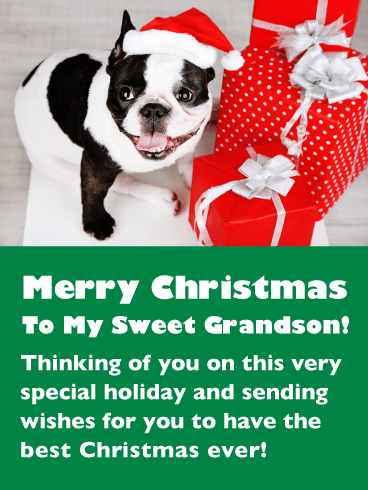 So send these perfectly wrapped Christmas gifts and puppy on their way to wish your sweet grandson the best Christmas ever! 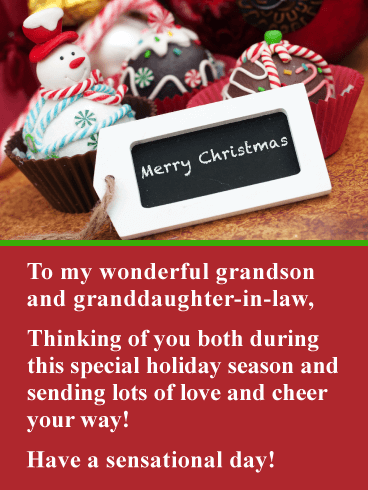 Let your grandson know he is on your mind this holiday season by sending this great Christmas card his way! Everyone loves Santa no matter what their age, so this Christmas card is a must send! It showcases Santa delivering gifts in a vintage airplane. It’s classic! 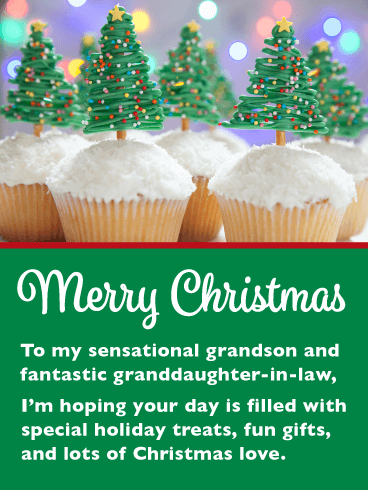 He will be touched by the fact that his grandparent took the time to find such a perfect holiday card. 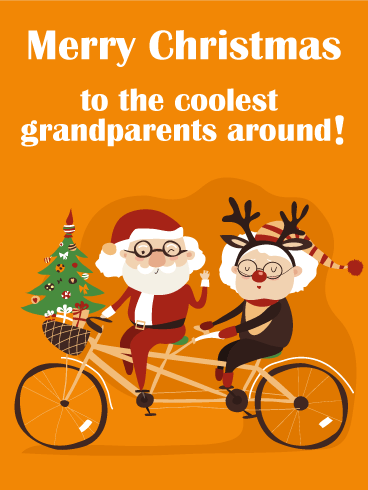 Let Santa wish your grandson a great day by sending him over without delay! 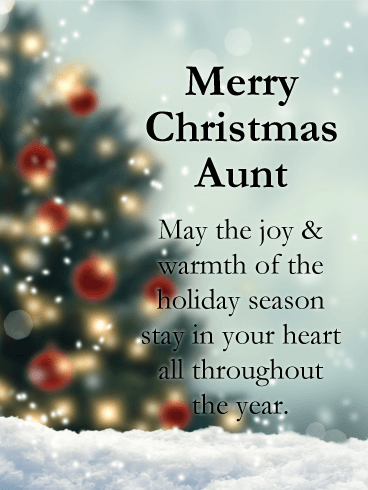 The wonder of the season is beautifully captured in this Christmas card for your aunt. 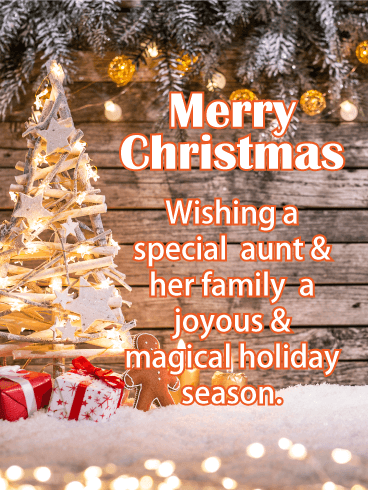 A background of ornaments, silver lights and snowflakes add plenty of whimsy, and the sentimental message says it all: it's the most wonderful time of the year to send your warmest, most heartfelt wishes. 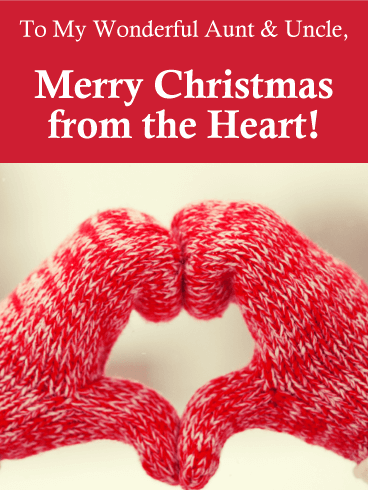 Whether she's celebrating with you this year or miles away, you'll always be connected to each other at Christmastime. 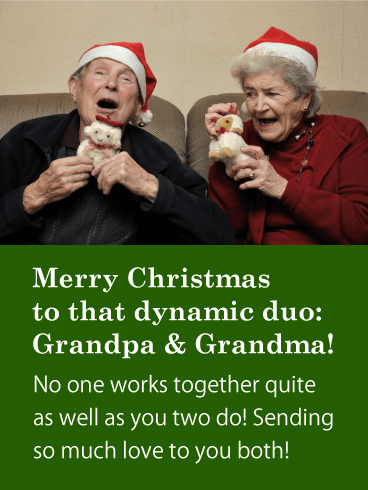 Heartwarming is the best way to describe this Christmas card for your aunt and her husband. A golden lit background brings a wondrous touch and the gift, ornaments, tree branches and pinecones are all charming touches. 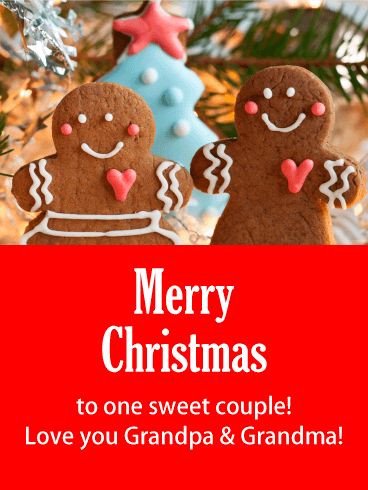 It's a sweet reminder that a couple as special as they are deserve all the joy & love that surround them this time of year because they make everyone feel merry & bright. 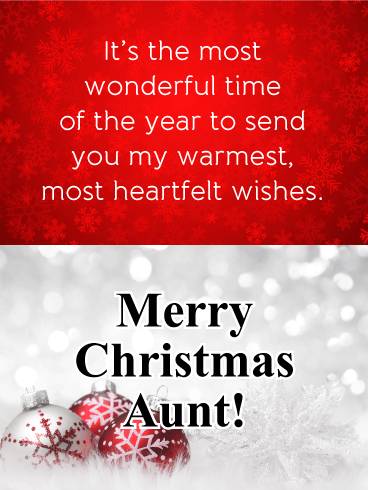 This beautiful card will bring happiness to a dear aunt and her family during the holidays. 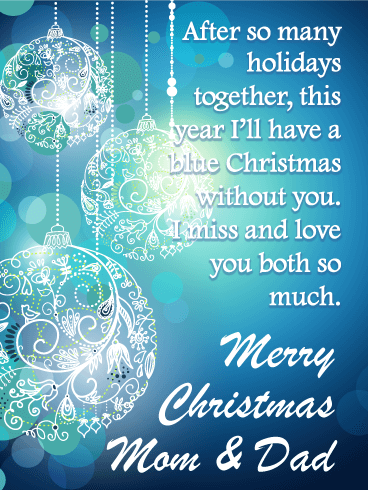 Charming white Christmas trees and twinkling white lights against a cool blue winter background add a serene touch, and the words will let them know that you're hoping they carry all the joy of Christmas in their hearts throughout the holidays. Their Christmas style slays (or sleighs! ), and they both hold the season Deer-ly. 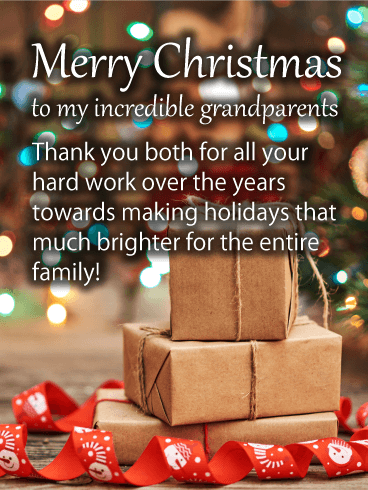 For the greatest grandparents ever, we try to say this clearly. The love we feel for our family really gives us pause, but none could ever be cooler than our very own Mr. & Mrs. Claus! Sending greetings doesn't have to be hard. When you have a bicycle built for two on a charming Christmas card!